I’m extremely glad there’s a few First Foundationers who saw through the guise of the Second Foundation. It borders on blind-faith, as the evidence that there ever was a deception is essentially “that was too easy…”, but none the less I’m glad. The back and forth between Golan Trevize and Harla Branno is a very well done game of cat and mouse. Well, has Branno has all the real power it’s more, cat and flea, but her desire to use him as a “lightening rod” for the Second Foundation, gives him clear leverage. The gravidic ship, and amazing computer interface are quite excellent perks of being a lightening rod however. Finally someone’s curious about Earth! Conversations between Janov Pelorat and Trevize discuss a lot of problems I had with the set up of the universe. Mainly the lack of other-worldly life; a galaxy full of only humans and their inventions seems rather dull. On top of the lack of non-intelligent life; humans seemingly brought the plants and animals from Earth and found little to none as they explored. And many passing questions about this version of FTL travel were addressed, I especially like how the presence of a strong gravity field keep them from jumping safely; this gives a very realistic-feeling limit to the speed of travel. Gaia… now there’s an idea. An entire planet, down to the molten core, acting as a single organism. There seems to be some form of individuality left in the humans who are “part of Gaia”. They’re not as Borg-like as I expected them to be. They do share some hive-mind characteristics, but the differences were significant. Obviously the Borg assimilated, while Gaian’s apparently must be born into the super-mind. The Borg, while semi-robotic, are not bound by the Three Laws of Robotics, or the whatever the version that Gaia has. An interesting idea occurred to me while considering Gaia: The analogy Bliss used was that each individual was a “cell” of the larger being, Gaia. If one were to extend that analogy, cells are not aware that they are part of a greater whole, they simply go about their business. What if people are the same innately, and a hive-mind is not necessary for the larger Galaxia that Trev chose. This idea would mean there were predictable group motions, while leaving the individual still independent, i.e. Psychohistory. Near the beginning of Chapter 19, Trevize voices his being bothered by Bliss referring to him as “Trev”, in the monosyllabic tradition of Gaia. I believe he corrects her before this, but I noticed a small change: Shortly before he makes his choice, Trevize states that he doesn’t care what Bliss calls him. And moments after, the narrator refers to him as “Trev”. This was the first time I noticed it, and as far as I can tell the only time it happened. And only sentences before he finally chooses Gaia. I think the interplay between who he would choose, and what he prefered to be called, was a very intricate touch. 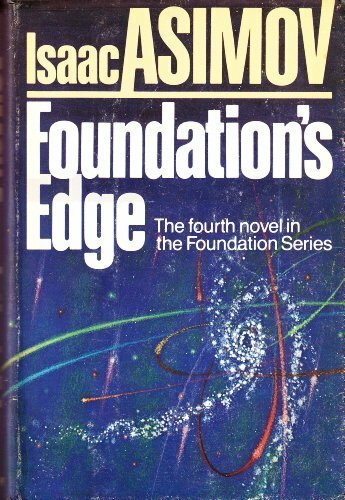 The ending was classic Asimov, the removal of Earth from all records was not done by Gaia… Or was it? It definitely a question that could fill the next book. Either Gaia did hide Earth, if so why? Or it did not, and if so… Who did? Also I found Trevs “choice” an interesting one. Putting aside his unusually ability to be right, it was an interesting topic in and of itself. Trevize tells us his logic was that joining team Gaia was the slowest acting, and therefore only reversible, option he had. Which after being explained, is quite clear (in true Asimov fashion). As I was reading, I put myself in his shoes, and found myself leaning toward Gaia as well, but for different reasons. I found the combination of more or less holding to the Seldon Plan, with the idea of a “living galaxy” incredibly appealing. It would seem to perfectly keep all living systems as happy and in balance with each other, as possible. Obviously this comes with the question of, “Will one lose one’s individuality by joining Gaia/Galaxia?”. The inhabitants of Gaia seem to think that no, they are still individuals in addition to being Gaia. That is even what Bliss uses to distinguish her ‘cell analogy’ from reality. But without experiencing both, I suspect one can never truly know one way of the other. There is the concept of being “bound” by the modified laws of robotics that govern Gaia, perhaps being bound means losing part of one’s free will. And some would argue losing part of your free will is the same as losing it all. But then I’m forced to ask, do we have free will to begin with? And in a crude mimicry of who is quickly becoming my favorite author, I leave you that question.